The data that flows from your school's MIS to the Assembly Platform is controlled by you at all times. In order for sensitive data to be extracted, your school must accept an app's data access request. 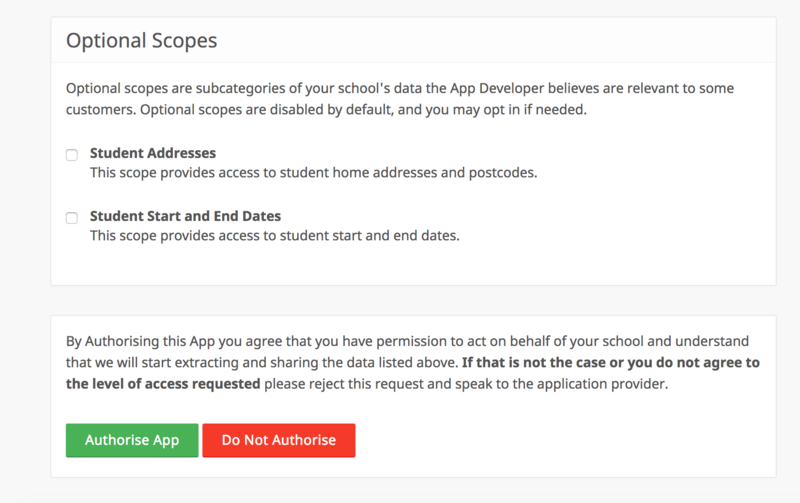 Before you decide whether or not to authorise the app, the data access request clearly shows the scopes of data which the app will have access to. The description underneath each scope name provides more information about the data fields contained within the scope. No sensitive data can flow to the Assembly Platform until you grant your first data access request, and we can only extract scopes you've explicitly authorised. (The one exception to this is the "Public School Data" scope, containing only non-sensitive information such as the school name and URN, which we access after you've signed up to the platform to validate and complete your connection). The Data Access Request is divided into required and optional scopes. Required scopes must be shared in order for an app to be authorised. We advise app developers to define scopes as "required" only if they are necessary for the app to function as intended. Non-essential scopes are listed as "optional". 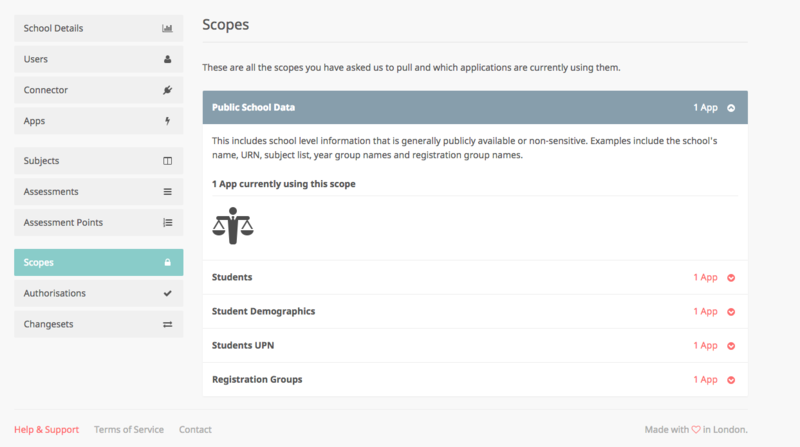 As a school, this means that you can choose whether or not you wish to share these scopes with an app by selecting or deselecting the tick box next to the scope name. Even if you decide not to share this additional data, you will still be able to authorise and use the app. At any time you can use your school's admin dashboard to see the scopes that have been authorised and the associated apps which are accessing them. It's also important to explain that in order to make our Data Access Request process work, we also need to ensure a working connection is established with your MIS. MIS use a range of configurations regarding permissions and access for services like Assembly. Our approach is usually to set up a connection with the standard permissions for third party or data extraction software. However, we emphasise that this connection doesn't actually allow Assembly to access or transmit any sensitive data from your school without you consenting to an additional data access request as outlined above. 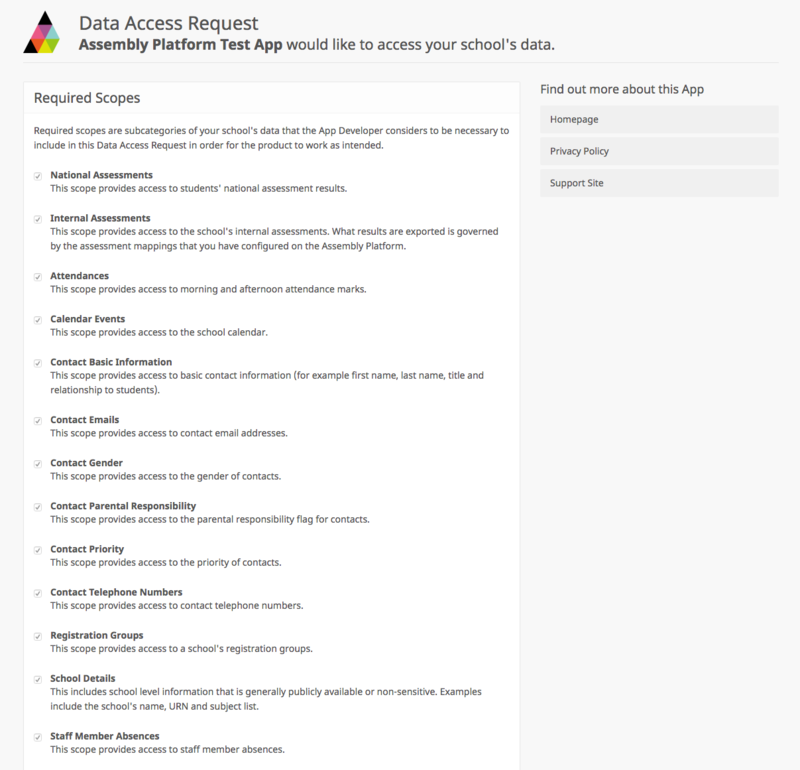 One way of thinking about it is that there are two "taps" between the school and an app: one within the MIS (sometimes using user permissions) and one within the Assembly platform (via the data access request). Both taps need to be turned on for data to flow. We think it's much easier to control, limit and explain what data is flowing through the Assembly tap. So we ask for you to open the MIS tap, safe in the knowledge that the Assembly tap gives you everything you need to control data flows in a secure and reliable way.